Barack Obama's jihad against Syria encountering more public and political setbacks. More revelations of extreme NSA wrongdoing. Colorado gun-control Democrats recalled by voters. Chicago moving towards allowing handgun ownership by non-criminals. The new Catholic Pope saying that atheists may go to Heaven. Not directly political, but we can certainly see it as the loosening of a type of authority. These are events that libertarians would consider to be moves toward peace and freedom. Also notable is the distinct lack of major violent events (even in the face of gigantic competing demonstrations in DC yesterday), and the lack of major new government initiatives. So what happened? Pallas, patroness of non-aggression and liberty, has ingressed into Leo (ruled by the Sun, who is a consistent ally) and is now within orb of a septile aspect with the Sun. 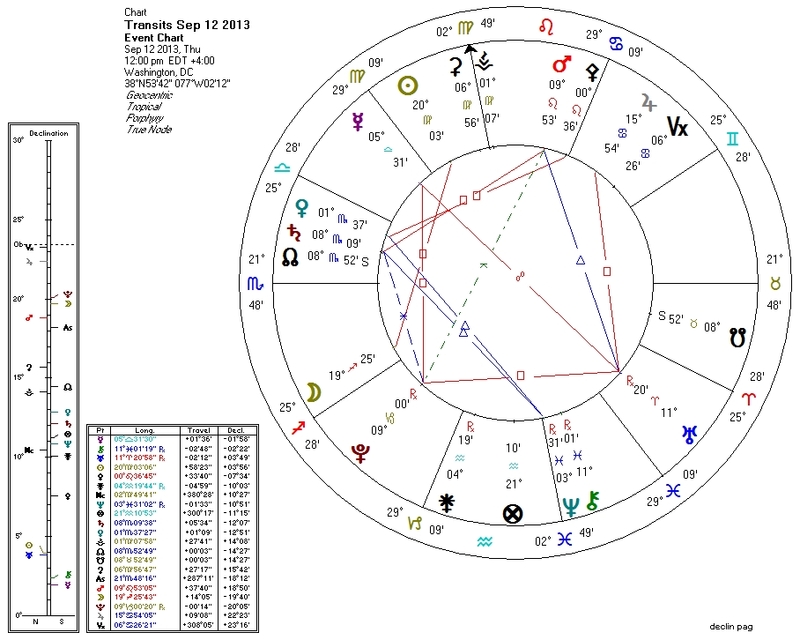 In addition, she and her current ruler the Sun are now currently out of orb of the three factors that inhibit her: Pluto, Jupiter, and the South Node. These configurations are very short-lived: like the rest of life's fleeting joys, perhaps we should make the most of them when they happen.